If you weren’t able to get down to Orlando this week for the big PGA Merchandise Show, here’s a quick look at some of the behind-the-scenes stuff from a few of the biggest names in golf. A montage of show clips via PGA.com. An inside look at the Scotty Cameron booth. The guy with same name made an appearance. Golf Channel’s Morning Drive set with guest Colin Montgomerie. On-set with Colin Montgomerie! Coming up next, we're going LIVE on our Facebook page with Monty. Johnny Miller is on site with the Golf Channel team as well. 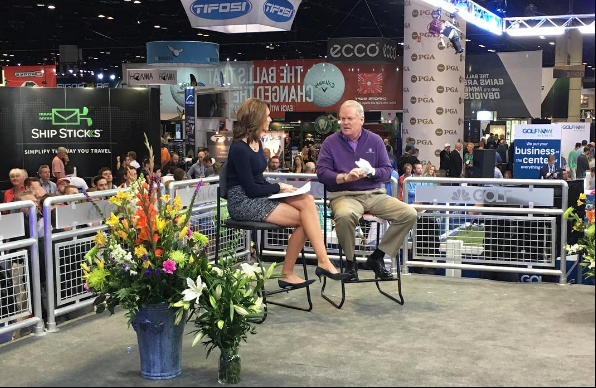 @cararobbo sits down with Johnny Miller at the #PGAShow. This looks like the old baseball carts that used to drive out the relief pitchers back in the day. A little test swinging at the Cobra booth. Day 2 of the #PGAShow is in full swing! The Power Tee’s mission is clearly to make golfers even lazier. A couple of interesting aids for better putting. A look at the big, splashy Footjoy booth. A neat look from above – thanks to the Golf Channel.